Sugaring is not currently offered at SLOCO. Learn more about our eco-friendly waxing services. Not all sugar is created equal. 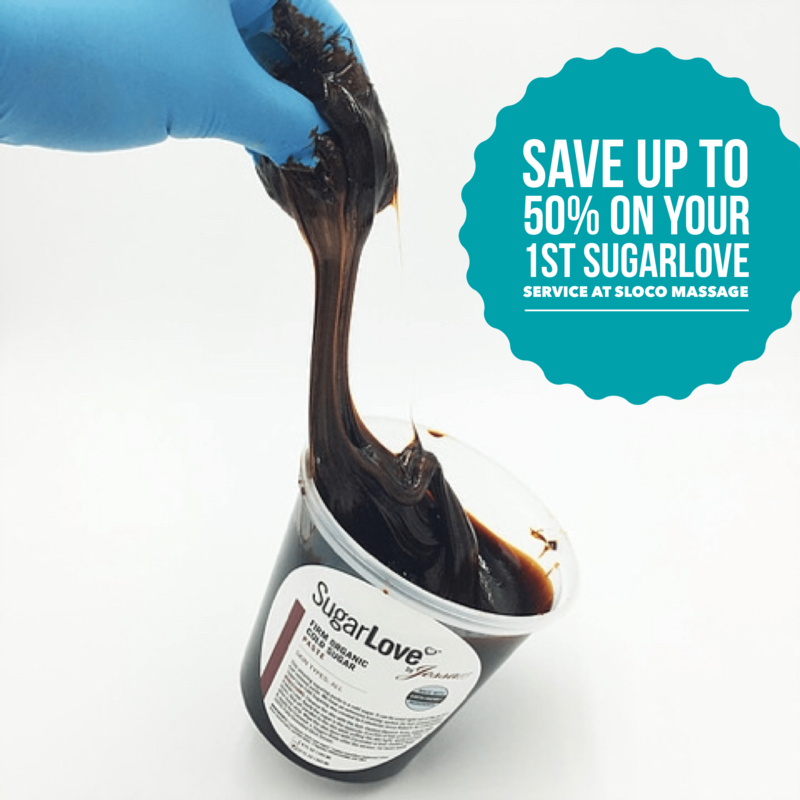 We use SugarLOVE which is vegan, biodegradable, non-toxic, non-GMO, source within California (whenever possible), preservative free and made from 100% USDA Certified Organic ingredients. Get up to 50% off your first sugaring hair removal service at SLOCO when we launch this new service. Claim your offer today and we'll send you the coupon as soon we have appointments available! Goodbye ingrowns…Hello to smooth, healthy skin! We’ll teach you how to care for your skin before and after your sugaring service, to ensure you have a smooth (pun intended) experience. Preparing your skin properly allows for less pain, irritation and longer lasting results in record time! Sugaring also doesn’t warp or tear the follicle (which can lead to more ingrowns) because SugarLOVE is removed in the same direction as hair growth. Caring for your skin after your service is just as important, ensuring those ingrowns don’t pop up. Don’t know how? Don’t worry… we’ll teach you! Your hair needs to be 1/8th of an inch in order for wax to grip the hair. Sugar can work its magic on hair half as long! Coming in every 3 weeks can lead to permanency after 6-12 months (with the exception of hormonal changes that affect hair growth), because it gets hair in the anagen phase. Extracting hair at this stage of hair growth cuts off the hairs “food source” and helps collapse the follicle wall. Over time, as the follicle shrinks the hair becomes more refined (thinner) and can eventually diminish! 98 out of 100 people who try this Cold Sugaring technique never go back to waxing. Sugaring is less painful because SugarLOVE repells water, so it doesn’t stick to live skin cells. It is also completely pliable, so the elastic formula doesn’t pull on skin and since it is removed in the same direction as hair growth, there is less pain.